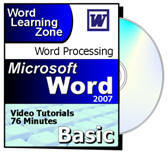 This course is for the novice user who has little or no experience with Microsoft Word except for our Word 2007 Basic 1 course. We will begin by covering the different Word Views, such as Print Layout, Draft, and Outline. Next, we'll spend more time with the Font Group commands, including underline, subscript, superscript, the highlighter pen, change case, and clear formatting functions. You will learn more about the Paragraph Group functions, including full justification, line spacing, how to select the entire document with one keystroke, and how to add/remove spacing before/after a paragraph. Next, you'll learn how to increase / decrease paragraph indenting, and set borders and shading for your paragraph. In the next lesson, we'll cover custom bulleted lists, numbered lists, the bullet and numbering libraries, multilevel lists, and sorting lists & paragraphs. 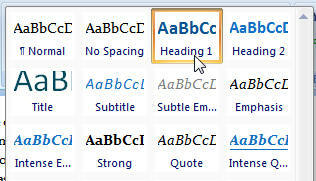 Next we'll learn about one of the most important and powerful features in Word 2007: Styles. If you learn how to master Styles, then constructing professional-quality documents becomes much easier. You'll first learn about the Format Painter, then what Styles are, how to use them, and how to use the Normal, Heading 1, and Title Styles. In the next lesson, you'll continue working with Styles. 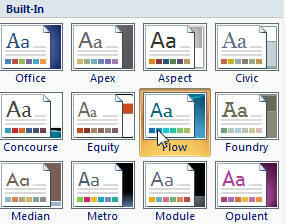 You'll learn how to change Style sets, color sets, font sets, and the overall document Theme. Next, you'll learn about the Find and Replace feature. You can find any text in your document, and optionally replace it with other text. You'll also learn about Replace All, and the Reading Highlight. Finally, you'll learn about one of my favorite features: Shrink to Fit. You can use this to shrink your document by one page - in case you have a document with just a tiny bit of text on the last page. Again, this is the perfect class for anyone who is new to Microsoft Word 2007, and has finished my Word 2007 Basic 1 course. If you have little or no experience with word processing, or you just want to get familiar with how Word 2007 works, this class is for you. Lisa on 9/14/2009: Richard, How do I change the multilevel list to a different look? For instance if I wanted the first line to be a bullet, then the next line to be a dot and next and arrow. and so on? Richard Rost on 9/16/2009: Lisa, this is a little more complex. You'd have to either do it manually (changing each bullet) or define a new LIST STYLE, which is something we'll get into in the Expert classes. Richard on 12/20/2009: My student, John S., mentioned to me that he had a hard time replicating the results I got with the multilevel list in this lesson. He hit the TAB key and the list didn't indent as it does in the video. This is the DEFAULT behavior of the list, but if for any reason you've modified your Word settings, it might not work. Go to Office > Word Options > Proofing > AutoCorrect options > Autoformat As Your Type tab. Make sure the "Set left- and first-indent with tabs and backspaces" box is checked. Thanks to John for sharing this with me. I'm sure someone else will also encounter this problem. Carol Case on 6/2/2010: When willthe Expert Levels be readery? They're coming. I have a major project that I'm working on right now. As soon as it's finished, I'll be producing more Office 2007 and 2010 lessons. madeleine on 10/15/2011: RicHard is a great teacher.The lessons are very helpful. maribeth on 8/29/2012: Very clear explanations, I just feel I want more,(hoping half price) anyway its good for a starter/beginner like me. Can't wait for the next lesson. I tried typing in =rand(1,5)on a document and it didn't work. What could I be doing incorrectly? I'm not sure, to be honest. It's always worked for me. Melodie Ledford on 5/25/2013: These tutorials have been EXCELLENT!!! I can't wait to get to the next lesson!! Pamela, these features work in most versions of Word. Without seeing your system, it's almost impossible for me to tell you what's wrong. stacey post on 7/29/2013: Hello! Is there any way to have both the video AND my Word program on the screen at the same time? Currently I am minimizing Word and having to bring it back up to follow along with the instructions. This is very time consuming so I hope there is another solution! Thank You! I've kept my videos small so that they should fit on the screen side-by-side with Word (or whatever program you're using). If you use my Online Theater you have limited formatting options available, but if you DOWNLOAD the videos to your computer then you can watch them with whatever video program you have installed (I recommend VLC Player, but Windows Media Player works fine). Then you should be able to size them next to each other without a problem. You won't benefit from the student forums, but you can check those after you're done. stacey post on 7/31/2013: THANK YOU!!!! I am so excited that I am able to do exactly what I need by having the multiple views on the screen. Now I can follow along with you perfectly. Your expert instruction and fabulous customer support make it so much easier to learn something that until very recently was overwhelming! Can't wait to be able to add this new skill set to my resume, thank you again. You're very welcome. I'm glad you're enjoying the lessons. Denise S Werst on 2/2/2014: Does the clear formatting option remove paragraph breaks? Kathryn Cooney on 5/22/2014: If I have to stop my lesson, how do I know where I have left off without marking it down on a piece of paper? If you're using the Online Theater, in the bottom left corner of the SETTINGS section, it will display the last lesson you watched. If you want to keep track of the TIME in the middle of a lesson, you can put it in the NOTES box below that for next time. Charles Stackhouse on 7/1/2014: Really enjoying your courses i am learning alot of information. Have created six spread sheets today they look professional. Jackie Appleby on 11/30/2014: I am using office 2013 and I do not have the change styles button. How do I get to those options? There should still be the Styles on the HOME tab. Is there the option in the DESIGN tab also? The ribbon hasn't changed much from 2007/10 to 13. Jackie Appleby on 12/2/2014: I have the big box with the predefined styles in it on the home tab. I don't have the change styles button with style set, colours and fonts in. That should be in the DESIGN tab. There is a MS article that should be useful. valorie on 1/9/2016: I was unable to create the automatic horizontal line shortcut that you teach in this Basic 2 Document Setup lesson. After much internet research I discovered that this and other shortcut options box can be turned on or off in the Proofing Autocorrect features. Do you explain this in another area that I missed? You could try searching in the Course Index to see what topics are covered, I can't remember off hand which one it was in. Fackson Mashuda on 4/26/2016: I am a computer novice but your computer basic 1 lessons were so helpful to me, I am here in Africa, Zimbabwe but the problem is I don't know the way forward to get the next lessons. Amber Turner on 1/3/2017: How long will it take for me to get to start my courses? It should approve once the payment has gone through, you should get an email saying it's been approved and ready to watch. Is it not in the Theater? If not try Customer Service. You need to own the video course first, then it's an option in the order form. It it listed in the Theatre? So you click on download link and what happens? Modi Waggeh on 3/17/2018: More power to your elbow ! Did you choose style that was part of the theme or just a colour from the colour picker?